The Fifth Power is the energy used to cast spells. A speaker uses her body as a conduit for outside energy, lets it flow through her, forms it with her will, and releases the spell. The Fifth Power will slowly flow back in; this process can be hastened by drawing the right signs onto tongue or throat, or by swallowing substances like clams or potions. Some artifacts can also provide the Fifth Power. Speakers say the flowback feels like a numb limb waking, but in the entire body. The Fifth Power fluctuates in strength - with the exception that there are no natural powerless zones - but more importantly, it is strongly aspected. Aspects can favour or punish any kind of spell; spells cast on windy days, spellcasters wearing blue, spells that last longer than a day, spells that are cast by raganaj, healing spells, memory spells, or anything else. "Like this, it can only go wrong. I need three totems, a pound of Fifth clams, a collector's handbook, and someone to dampen the aspects in the forest. Maybe, just maybe, it can still be stopped." Places and lines of power are a changeable network of more saturated zones that allow casting without the danger of cataclysmic failure, and are sought out by artifact makers and researchers. Casting along lines of power allows for much greater distances - in case of wizards, sometimes across the continent. Places of power are nearly always marked by standing stones, guarded by either mage or wizard and often safeguarding dangerous artifacts. "When the new markmaker started, she confused the placeholders and the entire inner building was aspected to favour emotional spells, which kicked all twelve gold fairies right out of the libraries. They threw a tantrum, of course - we were all bandaged for a week." My fiancé invented the name of the Fifth Power - half as a joke - which suited me just fine, as Kitas is governed by the mystical numbers four and five; and between the four elemental energies, plus the spirit as the fifth element, having the will-managed magical power called a fourth or fifth something was great. It remains to be difficult to manage this crucial and complex part of my world - how does each tradition profit from the Fifth Power's strength? Awlies are a kind of livestock that's popular worldwide. They are large herbivores that never really stop growing but usually are slaughtered by reaching the human knee. Awlies have grey forelegs, chest, and head, a red spot on the forehead and red ear insides. They are easily satisfied and lay about ten small round eggs a day, their soft fur is made into clothing, and the meat is good for eating, although it quickly takes on a sweetly taste. The skin is made into leather or parchment. Young children love the quiet awlies who happily let them play among them and don't mind them cuddling in the soft fur. Unlike with many other pets, bug fairies don't mind awlies going to the block too much. "After my second marriage, we became vegetarians, which was good for the children because the awlies would live, and better for the awlies themselves because they grew to my shoulder. Then one night, they broke out of the pen and vanished into the forest. My son swears he still sees them wander by our well." 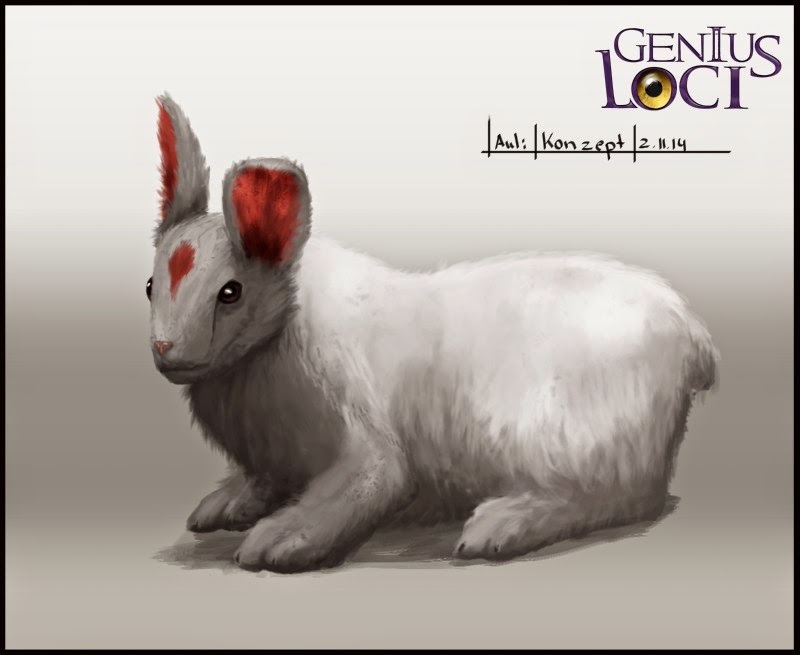 There is an entire Genius Loci bestiary by now. Animals are so important to fantasy settings - with so much wilderness, there must be wildlife, too, even if awlies better qualify as cattle. I wanted to have as few Earth animals as possible. I'm not entirely decided if there will be any creatures we know at all - for now, there are bears and dogs, but maybe I'll change that. A short flavour text I wrote, in English (top) and German (below). "It is also unknown if it produces the pigment itself, or if it gets it from the host. We have no idea what makes this plant tick", she sighed. "Fantastic", smiled Sagronn. Mirsruun raised her eyebrows inquiringly. "I thought mages tried to learn everything about the world? Is it not frustrating to encounter so many unexplored things?" "Not in the slightest. You see, we are convinced that one day we will know everything. And until then, it's simply a lot of fun to learn it all." Mirsruun smiled, too. In the next hallway, she pointed at a door with a stained-glass window. The "workshop" was a lavishly furnished greenhouse with a glass roof, filled with well-stocked shelves; at night, hanging mushroom pots would provide light. Pots, tubs, bowls, and basins housed aromatic plants, insects and tiny nature spirits fluttered through wafts of mists. Each piece of furniture was wonderfully adorned with enamel and inlays. 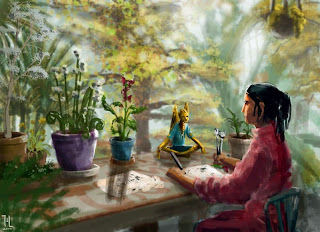 Sagronn often had to remind himself that it was perfectly normal for yellowforesters to live as elsewhere kings resided, and put his bag down on the generously decorated desk, while he tried not to gawk too stupidly - he saw six hundred and fourteen different kinds of plants. Then he spotted the pots with the new flower. He instantly noticed the differences to the plants Mirsruun had suggested comparisons with. The venation was more regular, the pistils were shaped completely different, the petals two thirds heavier, and the stems at least two millimeters thicker. Mirsruun waited for a moment besides the door of her messy workshop. The mage stared first around the room, then at the pots, apparently forgot about the world, pulled out notepaper and began schematizing it. With somnambulic sureness he drew up a stool with his foot and blindly reached for a scooper. She smiled again and left the room - she doubted he would have heard her, had she explained mealtimes to him. Sagronn was just describing the average length of the anthers when he ran out of paper. Holding two tiny scoopers, he rummaged around in his bag and found nothing. "Second drawer from the bottom", a high-pitched voice startled him out of his phrasing. He looked up and found himself eye to eye with a lurking gold fairy. He froze a moment, then slowly put the scoopers back into their accustomed holders. The goldfairy watched and nodded, satisfied. "Sagronn", Sagronn introduced himself a little more relaxed, "Lair. I am here to inspect the new species." He pointed to the pots, next to which the goldfairy had settled itself cross-legged. He had little experience with goldfairies. This one had painted its legs with a raganaj pattern of fourteen stripes and wore the same clothes as the other employees, except the back was cut low for the wings. It was sixty-three centimeters tall, had a wingspan of sixty-seven centimeters, eleven large feathers on the head - which meant male - and weighed, without clothing, four thousand three hundred and twelve grams. "Driinan of the Racalla", the fairy said and impatiently waved away a bumblebee. "Second from the bottom. Is it a gaskan?" Sagronn blinked. In the drawer was a glass box with fifty-six sheets of dry paper, from which he picked up nine. "No. I think it is either a wild form of the salbreela or a new species. I will have to distill them to say for certain." "Not this one", Driinan nodded towards the largest, which meanwhile had attracted an almost hand-sized spirit, that was putting on a wobbly race with two bumblebees in the pot's coaster. "One of the smaller", Sagronn agreed. "Is there an apothecary where I can distill?" "There is the scentmaster's workshop", Driinan explained while he reached for a sheet of paper. Sagronn had put it aside after a speeding bug had landed in the wet ink. "It has all the tools. A scentless room as well. There are even clothing hooks - just like here, by the way." He pointed at the hooks, then Sagronn's jacket on the stool. While Sagronn put it up, Driinan's long hands folded the paper into a slim, knife-like shape. Sagronn interestedly observed his precision and strength - four folds were no problem to the fairy's thin arms, and he was only four degrees off the perfect angle. When the foldwork was done, Driinan looked up sharply and pointed towards the door. "Right, second left, blue door. How are you related to Ralgonkin?" Sagronn blinked again. Ralgonkin Lair was a famous mage of his tribe and had went missing in the Broken Jaw Rocks here in Racallahan. He called up his family tree before his inner eye. "My great aunt's husband is his cousin. Do you know him?" "I know his guide. An untidy fellow. 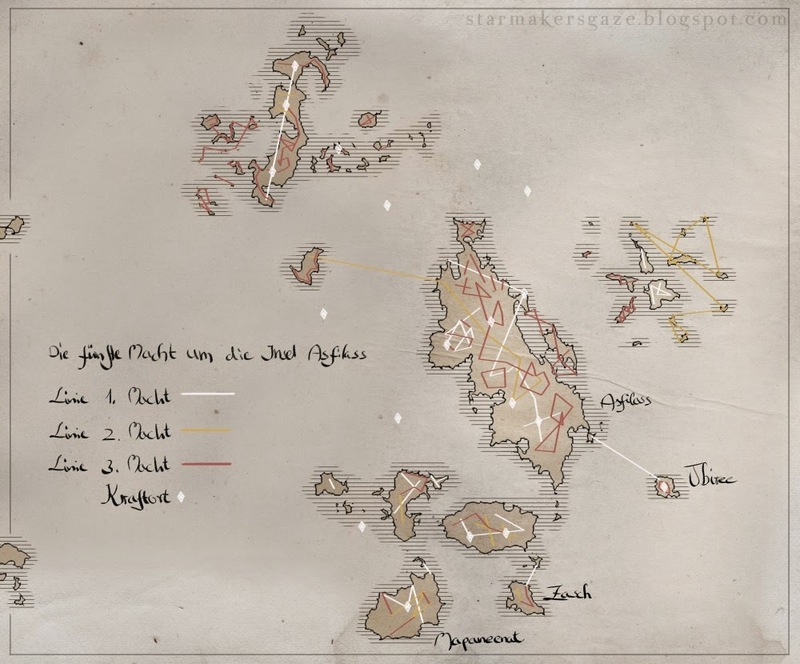 I am not astonished that they never reemerged, and the rocks are circled for good reason." Then he stood up smoothly, jumped off the desk's ledge and returned to the greenhouse's mists from whence he had come. His takeoff had not moved a single paper on the table. Sagronn could not ask his question: It took nine days to hike around the Broken Jaw Rocks. Protective circles of that size could be counted on both hands. Was it broken, or was it still intact? "Es ist ebenso unbekannt, ob sie diesen Farbstoff selbst herstellen oder ihn von der Wirtspflanze aufnehmen. Wir haben keine Ahnung wie diese Pflanze tickt", seufzte sie. "Fantastisch", lächelte Sagronn. Mirsruun zog fragend die Augenbrauen hoch. "Ich dachte Magier versuchten alles über die Welt zu lernen? Muß es nicht frustrierend sein auf so vieles zu stoßen was ihr nicht kennt?" "Nicht im Geringsten. Schau - wir sind überzeugt, dass wir eines Tages alles wissen werden. Und bis dahin ist es einfach ein großer Spaß all diese Dinge zu lernen." Auch Mirsruun lächelte. Im nächsten Gang wies sie auf eine Tür mit farbigem Glasfenster. Die "Werkstatt" war ein reich eingerichtetes Treibhaus mit gläsernem Dach, voller wohlgefüllter Regale; nachts dienten Pilzampeln zur Beleuchtung. Kübel, Becken, Kästen und Töpfe beherbergten die duftenden Pflanzen, durch die Nebelschwaden gaukelten Insekten und winzige Naturgeister. Jedes Möbel war wunderbar mit Lack und Intarsien geschmückt. Sagronn mußte sich oft daran erinnern, dass es für Gelbwälder völlig normal war zu wohnen wie anderswo Könige residierten, und legte seine Arbeitstasche auf dem großzügig mit Einlegarbeiten verzierten Schreibtisch ab, während er sich bemühte die Pracht nicht allzu glotzäugig zu bestaunen - er sah sechshundertvierzehn unterschiedliche Pflanzenarten. Dann entdeckte er die Töpfe mit der neuen Blume. Ihm fielen sofort die Unterschiede zwischen den Arten auf mit denen Mirsruun ihm Vergleiche vorgeschlagen hatte. Die Äderung war gleichmäßiger, die Stempel völlig anders geformt, die Blütenblätter um zwei Drittel schwerer, die Stengel wenigstens zwei Millimeter dicker. Mirsruun wartete einen Moment neben der Tür ihres unaufgeräumten Treibhauses. Der Magier starrte erst den Raum, dann die Töpfe an, zog sofort weltvergessen Notizpapier hervor und begann sie zu schematisieren. Mit schlafwandlerischer Sicherheit zog er mit dem Fuß einen Hocker heran und griff blind nach einem Schäufelchen. Sie lächelte wieder und verließ den Raum - sie bezweifelte dass er sie gehört hätte wenn sie ihm die Essenszeiten erklärt hätte. Sagronn beschrieb gerade die durchschnittliche Länge der Staubbeutel als ihm das Papier ausging. Er wühlte mit zwei winzigen Schäufelchen in der Hand in der Tasche nach und fand nichts. "Zweite Schublade von unten", schreckte ihn eine hohe Stimme aus seinen Formulierungen. Er blickte auf und fand sich Auge in Auge mit einer lauernden Goldfee. Sagronn erstarrte einen Moment und steckte dann langsam die Schäufelchen in ihre angestammten Behälter am Tischrand. Die Goldfee sah es und nickte zufrieden. "Sagronn", stellte sich Sagronn etwas entspannter vor, "Lair. Ich bin hier um die neue Art zu untersuchen." Er deutete auf die Töpfe, neben denen die Goldfee sich im Schneidersitz niedergelassen hatte. Er hatte wenig Erfahrung mit Goldfeen. Diese hatte sich die Beine mit einem vierzehnstreifigen Raganajmuster bemalt und trug die gleiche Kleidung wie die anderen Angestellten, aber im Rücken weit um die Flügel ausgeschnitten. Sie war dreiundsechzig Zentimeter groß, hatte eine Flügelspannweite von siebenundsechzig Zentimetern, elf große Federn am Kopf - das bedeutete männlich - und wog ohne Kleidung viertausenddreihundertzwölf Gramm. "Driinan von den Racalla", antwortete der Feener und wedelte ungeduldig eine Hummel weg. "Zweite von unten. Ist es eine Gaskane?" Sagronn blinzelte. In der Schublade lagen in einem Glaskasten sechsundfünfzig Blatt trockenes Papier, von denen er neun herausgriff. "Nein. Ich denke dass es sich entweder um eine eine Wildform der Salbrile handelt oder um eine neue Art. Ich muß sie destillieren um es sicher sagen zu können." "Nicht diese", nickte Driinan zur größten, die mittlerweile einen fast handlangen Geist angelockt hatte, der sich ein taumeliges Wettrennen mit zwei Hummeln lieferte; als Rennstrecke diente der Topfuntersetzer. "Eine der kleineren," stimmte Sagronn zu. "Gibt es eine Apotheke zum Destillieren?" "Es gibt die Werkstatt des Duftmeisters", erklärte Driinan während er ein Blatt Papier heran angelte. Sagronn hatte es beiseite gelegt nachdem ein Käfer schwungvoll in der feuchten Tusche gelandet war. "Dort gibt es alle Werkzeuge. Auch einen duftlosen Raum. Und sogar Kleiderhaken - wie hier übrigens auch." Er zeigte erst darauf und dann auf Sagronns Jacke auf dem Hocker. Während Sagronn sie aufhängte, falteten Driinans lange Hände das Papier in eine schmale Form ähnlich einem Messer. Sagronn beobachtete interessiert die Genauigkeit und Kraft - vier Faltungen waren kein Problem für die dünnen Arme des Feener und er lag nur vier Grad neben dem perfekten Winkel. Als das Faltwerk fertig war, blickte Driinan scharf auf und zeigte zur Tür. "Rechts, zweiter Gang links, blaue Tür. Wie bist du mit Ralgonkin verwandt?" Wieder blinzelte Sagronn. Ralgonkin Lair war ein berühmter Magier seines Stamms und hier in Racallahan in den Gebrochener-Kiefer-Felsen verschollen gegangen. Er rief sich seinen Stammbaum vor's innere Auge. "Der Gatte meiner Großtante ist sein Vetter. Kennst du ihn?" "Ich kenne seinen Führer. Ein unordentlicher Kerl. Ich wundere mich nicht dass die beiden nie wieder aufgetaucht sind, und die Felsen liegen aus gutem Grund in einem Kreis." Dann erhob er sich geschmeidig, sprang von der Tischkante hoch und flog zurück in die undurchdringlichen Nebelschwaden des Treibhauses, aus denen er gekommen war. Der Abflug hatte kein einziges Papier auf dem Tisch verrückt. Sagronn konnte seine Frage nicht mehr aussprechen: Die Gebrochener-Kiefer-Felsen waren neun Tage lang zu umrunden. Schutzkreise solcher Größe waren an den Händen abzuzählen. War er gebrochen oder noch wirksam? 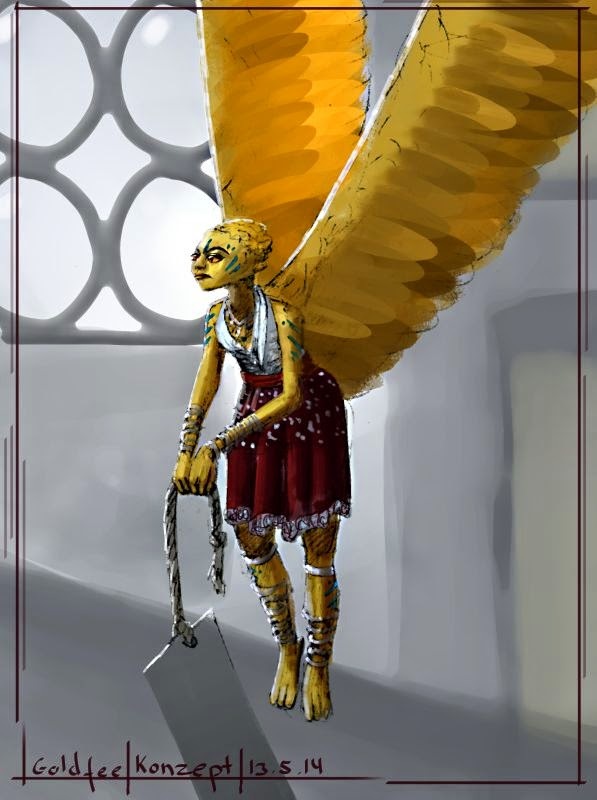 Gold fairies are creatures around 60 centimeters high with softly feathered wings and long arms. Their colour ranges from pale gold to deep glittering orange. Gold fairies are a little smarter than bug fairies, averaging a ten-year-old; their behaviour is a strange mixture of serenity and ferocity, and narrow-minded folk often dislike them. "I am here to keep order. You must follow this shelf plan. Everything depends on order. Your foolish assistant learned this is no joke to me, no? So follow." They keep to themselves, and live in either open nature or crowded cities, seeking out merchants' storages, libraries, printing-offices, and laboratories, making their living as aides by keeping shelves and storages in order. Otherwise, gold fairies are left alone and flock in small groups. They can be seen carrying packages about, or building things (to unknown ends; they're neither art nor mechanics). They prefer flying over walking, and regard their legs as decorative, occasionally useful appendages, rather than regular body parts. Like bug fairies, gold fairies have their own way of Speechcraft and are equally unteachable. Mages have lost sanity and digits trying to study it. "Always an occasion when goldfairies come to the shop. Last time they left with all my silver wire, half a litre of coloured ink, and a Kmalian teapot. Then went into the bakery and bought all the yellow pastries. I've stopped wondering what they do with the stuff."